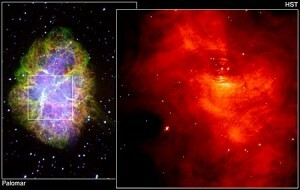 The Crab Nebula is the remnant of a star that exploded more than 900 years ago. At the heart of this debris lies a neutron star – a compact star with a mass greater than the Sun, packed into a sphere just 15 miles in diameter. In addition, this neutron star has a magnetic field and rotates 30 times a second, dragging a beam of radio waves around with it – a cosmic lighthouse, known to astronomers as a pulsar. A star with its mass symmetrically distributed about its rotation axis will not emit gravitational waves, no matter how fast the star spins. If the distribution is not symmetric, however, the star will radiate gravitationally. Also, real stars are not perfectly spherical, and the most general motion of such a rigid body is known as a `free precession’. This is simply a wobbling motion, such as occurs when a rugby ball is tossed into the air, with its symmetry axis describing a cone in space. This wobble may be excited by gas falling onto the neutron star from a companion star, or even as a consequence of the lighthouse beam itself. These mechanisms are currently under investigation here in Cardiff. Our results show that wobbling neutron stars are promising sources of gravitational waves.